I tremendously appreciate the cinema verite approach to performative cooking. The part about things leaking in the refrigerator, particularly, was very true to life. (My life, at least.) Now very interested in the book. Oh this made me laugh so much, but the end result is fabulous! Please say that you are writing a cookbook next. 2 (count em: 2) thumbs up. Excellent work. Haven't laughed so much in ages. I love baking but am hamstrung by a) having 1yo twins and therefore no time, and b) said twins having food allergies which means all cakes must be vegan. A cake that calls for chia seeds (responsible for that vibrant growth of "hair" for novelty plant pots in my youth) is no sort of cake at all. And yet somehow I find myself nonchalantly swapping chia seeds for linseeds and translating recipes from American English to, well, English and marvelling that the so-called cake rose and tasted nice. If by nice you accept I mean overpoweringly of cinnamon. And I am proud of my linseed/ cinnamon offerings. Still, they're no religieuses. 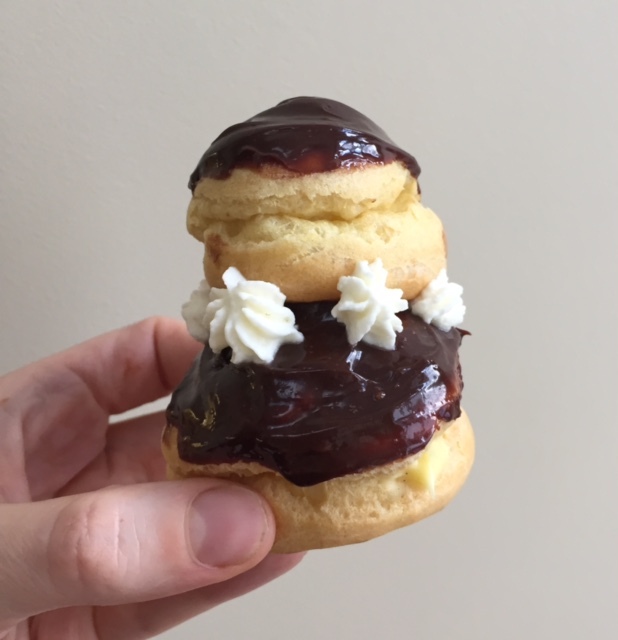 Now, apart from a snowman-like resemblance to a person, why would 2 choux buns held together by chantilly flourishes be called a nun? B - Are you drunk? I HOPE SO. Anon - I realise I have no idea. Maybe the dark plus white being nun's habit-y? You are very heroic with the vegan baking. You are amazing. The nuns are amazing. It's all amazing. I can't believe you must go through these cakey hoops in order for people to buy your book, which is already irresistible enough, but I'm glad for our sake that you are. That was pretty much my experience making eclairs. My arm nearly fell off. I have not been moved to make them at home since. How unlike the home life of our own dear Mary Berry. Dear Waffle, you brightened a pretty morose evening for me yesterday. I laughed out loud several times walking down the street. Congratulations on your amazing feat, they look absolutely delicious. Not sure I'll try to make them as years of typing have weakened my arms and I might not be up to all that vigorous whisking but they look heavenly. You should be exceedingly proud of yourself! I am now inspired to have a go at these. Loved your blow by blow account of the process, including expletives and actually laughed out loud! Those are gorgeous. I think you are ready to start your own cooking school/religious order: the Sisters of Perpetual Gluttony. GIMME!!! I WANTS THIS IN MY MOUF!!! Gosh. Long time lurker here; have loved your writing for years but never commented before. 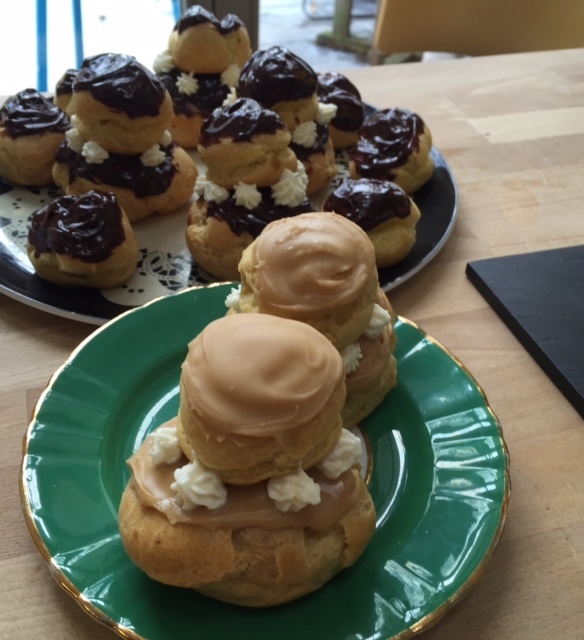 The spirit has finally moved me because I adore religieuses (we called them "nun buns" in my youth), and I am hugely impressed that you have made them. Wow. And yes, I have bought your book; two copies in fact, one for me and one for a friend who used to live in Paris. So hopefully that will keep you in vanilla pods for a few days at least. I hadn't heard of this pastry and I was going to google religieuses to see what they look like, but now I don't have to. Yours look lovely!